ONE OF THE MOST POPULAR TRAVEL DESTINATIONS IN EUROPE; MONT BLANC LOCATED AT THE BORDER BETWEEN ITALY AND FRANCE, IS THE HIGHEST PEAK IN EUROPE AFTER THE CAUCAUSUS PEAKS. THE MOUNTAIN OFFERS VARIETY OF WALKS FOR THOSE WHO ARE IN GOOD PHYSICAL CONDITION AND ACCLIMATIZED TO THE ALTITUDE. Max Elevation: 2,584m/8,478ft Tete de la Tronche. Mont Blanc is one of the most striking mountain destinations in Europe, which has led to emergence of numerous hiking paths and travel routes in the neighboring regions. One of such routes is the Tour Du Mont Blanc (commonly known as the TMB) which is considered a classic European long-distance hike. It undertakes an epic circuit clockwise starting from Chamonix in France, then crossing the Swiss and the Italian borders to finally return to Chamonix after 12 days of hiking. There is abundance of traditional alpine accommodation along the way, however, it is best to book in advance, since Mont Blanc is visited by thousands of mountain enthusiasts from all over the world every year. 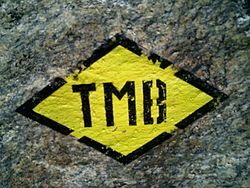 The TMB is one of the most popular hiking routes in Europe stretching for more than 160 km (100 mi) in length. The route normally doesn’t pose significant physical challenges and shouldn’t cause altitude sickness, but hikers are expected to be familiar with walking in mountainous regions with frequent ascents and descents, as well as rapidly changing weather conditions. It is also advised to be comfortable using gear and simple equipment during technical sections of the route. The Tour du Mont Blanc offers a great diversity of landscapes, wildlife, cultures, cuisine, recreation facilities and ski resorts. It also rotates hard technical days with days of lighter walking and rest, allowing you to soak in the dramatic Alpine panoramas. For more information or to book this or many other adventures visit Mountain Kingdoms.